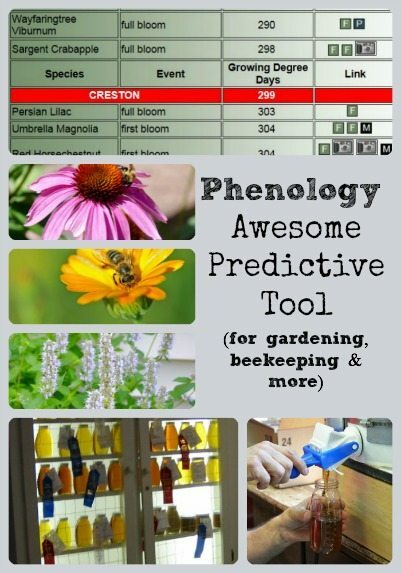 It utilizes temperature as a predictor because plant growth and insect emergence depend on temperature. “Growing degree-days” (GDD) are used as the predictive measure, and by knowing the GDD for your area on a given day, you can predict all of the things identified above. GDD is calculated as the sum of the numbers of degrees by which each day’s average temperature exceeds 50°F. For example, if the average temperature was 58° on March 16th, the GDD would be 8, and each day thereafter the GDD numbers are added together to give a cumulative GDD. So, how‘s this useful? 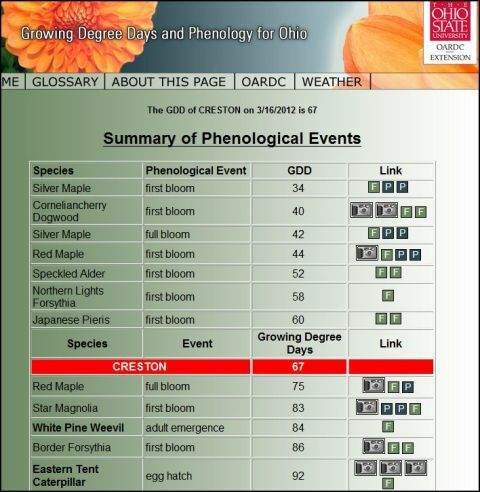 Well, for example, silver maples start to bloom at 34 GDD, and are in full bloom at 42 GDD. This is independent of the date of year, so in a cold year we might have 34 GDD in late April while in a warm year it might be in early March. By knowing when we’re at 34 GDD, I know when the bees will start collecting silver maple pollen (and hence when I’d better get more room on the hive for honey). If I didn’t know the GDD, I might wait too long to make more room in the hive and lose that opportunity for honey. Or, by knowing that Japanese Beetles emerge at 970 GDD, I can be on the lookout for Japanese beetle scouts a few days before we’re due to hit 970 GDD, crush the scouts I find, and because the scouts didn’t find my plants; the Japanese beetles will be invading the neighbor’s plants – not mine. Without knowing the GDD, I’d just be guessing at a date when Japanese beetles typically emerge. For those not living in Ohio, there is a GDD calculator application that can be downloaded to to an Android or iPhone and used to determine GDD anywhere in the United States (http://farmprogress.com/mobileapps.aspx). I think this tool has incredible potential, so we’ve started our own GDD spreadsheet to tie important events around the farm to GDD, rather than guessing when to do things. Someday, I hope to schedule all my planting based on GDD rather than on average frost dates, outwit the bad bugs and weeds, and know what the bees are planning. And, there are probably a bunch of uses I haven’t even thought of yet!